What is actually happening in the brain when one person looks at another? For people with prosopagnosia, an inability to recognize faces, information processing - the stages that our brains go through to recognize a face - is breaking down. "We refer to prosopagnosia as a 'selective' deficit of face recognition, in that other cognitive process do not seem to be affected," explains Bradley Duchaine, an associate professor of psychological and brain sciences at Dartmouth. "[People with the condition] might be able to recognize voices perfectly, which demonstrates that it is really a visual problem. In what we call pure cases, people can recognize cars perfectly, and they can recognize houses perfectly. It is just faces that are a problem." The condition may be acquired as the result of a stroke, for example. But in a recent Brain study, they focused on developmental prosopagnosia, in which a person fails to develop facial recognition abilities. "Other parts of the brain develop apparently normally," Duchaine says. "These are intelligent people who have good jobs and get along fine but they can't recognize faces." The primary experimental tool in this experiment was the electroencephalogram (EEG), which has the advantage of providing excellent temporal resolution—pinpointing the timing of the brain's electrical response to a given stimulus. Duchaine and his colleagues placed a series of electrodes around the scalps of prosopagnosics and showed them images of famous faces and non-famous faces, recording their responses. As expected, many of the famous faces were not recognized. They found an electrical response at about 250 milliseconds (ms) after seeing the faces. 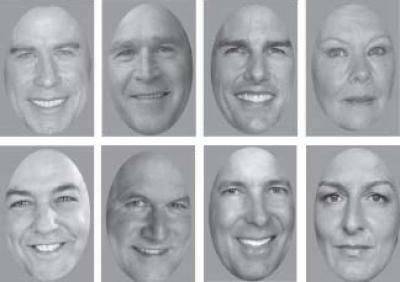 Among the control group of non-prosopagnosics, a real difference was observed between their responses to famous and non-famous faces. In half the prosopagnosics there was not. Surprisingly, however, in the other half of the prosopagnosic test subjects they did find a difference. "On the many trials where half failed to categorize a famous face as familiar, they nevertheless showed an EEG difference around 250ms after stimulus presentation between famous and non-famous faces like normal subjects do. Normal subjects also show a difference between famous and non-famous about 600ms after presentation, but the prosopagnosics did not show this difference," Duchaine observes. This pattern of results suggests the prosopagnosics unconsciously recognized the famous faces at an early stage (250ms) but this information was lost by the later stage (600ms). Duchaine concludes that even though they are not consciously aware that this is a famous face, some part of their brain at this stage in the process is aware and is recognizing that face, a phenomenon termed covert face recognition. He suggests that the other half of the prosopagnosics, who showed no difference between responses at 250ms, were experiencing a malfunction in their face processing system already at this early stage suggesting a different type of prosopagnosia. "The temporal lobe contains a number of face processing areas, so you can imagine there are many different ways that this system can malfunction. Not only can an area not work, connections between areas might not work yielding probably dozens of these different variants of this condition," he surmises. Covert recognition has been demonstrated in prosopagnosia acquired through brain damage, but Duchaine's work is the first convincing demonstration of covert recognition in developmental prosopagnosia, the much more common form.